If you follow me on Instagram you might have seen some curious photos of me having a custom dress form made last week. 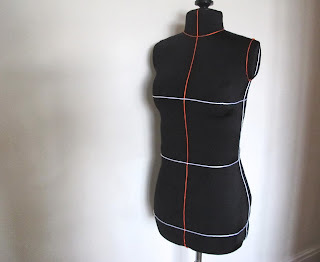 I've always wanted a body double to help with some of the trickier aspects of dressmaking - like pinning things on myself - but also for experimenting with drafting patterns by draping fabric, rather than relying solely on the flat paper method. (You can see some of the in-progress photos on the third row down). 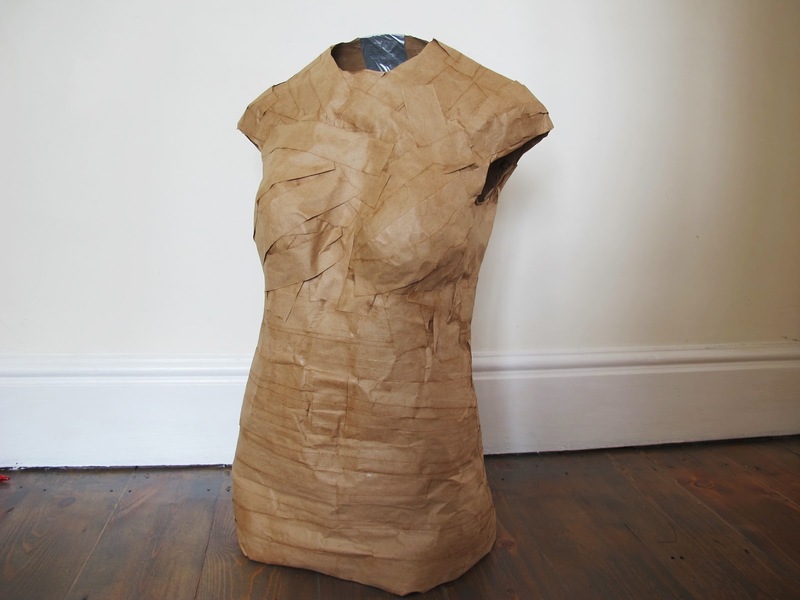 Over a year ago I'd bought the supplies to make a dress-form using the gummed paper parcel tape method, but then an evening where I could be wrapped up in tape never seemed to present itself and I put the idea to one side. However, last week just such an evening arose (I remembered the tape and there was a football match on which my husband could watch as he taped) and so we set about making a papery version of me. If you haven't heard of this before, the process is that you wear whatever old, but fitted, clothing you have to hand. You then ask your assistant to wrap you in cellophane (cling-film) to avoid getting too wet and cold and then tiny pieces of tape are dipped into a bucket of water and stuck onto your body to gradually create a body-double. The tape will eventually dry and when it does a crisp, fairly substantial, shell will have formed around you, at which point your assistant can release you by cutting up the centre back of the shell. It took two torturously long hours of standing extremely still, unable even to shuffle from leg to leg, during which I questioned who would willingly choose to be a beefeater to the Queen. By the time my shell was being dried with a hairdryer I felt wet, cold and exhausted. The next morning though, it all looked rather impressive, aside from it suddenly becoming obvious that my bust must have been somewhat flattened by the cellophane. However, with the paper tape method it's not too difficult to add to an existing form. Unfortunately though, my sculpting skills are limited and I ended up with one side rather larger than the other and no amount of extra padding, covered by more bits of paper tape could rectify the problem. Eventually, I decided that the only option was to turn a blind eye to my lopsided figure and to press on, hoping it would magically rectify itself at some point. 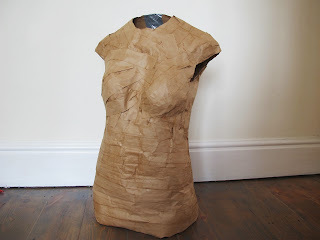 I stuffed the paper dress form with old offcuts of quilt wadding and made a stretch Lycra cover for it. 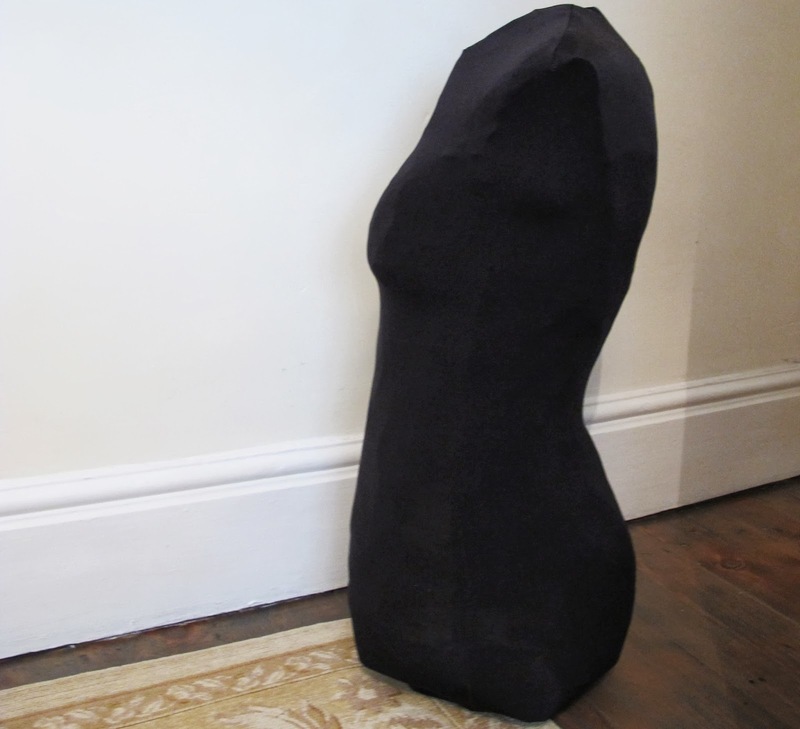 Once covered, I stood back to admire my work and felt perplexed that my bottom appeared to be so much larger than I had imagined it to be, or even remembered it to be when I'd seen the dress form cut off me for the first time. I also felt quite surprised by how rounded my back appeared. I left the stuffed form in the corner of our bedroom overnight and was woken the next morning by my son asking if he could go down for breakfast. As I tried to focus on the clock to see how early it was, he surveyed the mannequin with amusement, asking 'why does it not look like you anymore? I thought it was meant to be you?' At which point my husband sat up to see what he could be meaning and told me that my stuffing had indeed distorted its original shape and it no longer looked anything like me. On measuring it, its hips were indeed 4" bigger than mine. My enthusiastic if-I-stuff-this-dressform-really-densely-it-will-be-totally-fabulous-and-long-lasting ethos was ultimately my downfall. Damn. Although, I still feel really confused by this - how can paper stretch? It simply can't, so the whole thing seems a bit of an upsetting anomaly and I'm still left wondering where I went wrong. By this point I was feeling rather disappointed. I'd been hugely excited by the prospect of finally having something that I'd spent several years pondering and now it was misshapen beyond repair and the remnants of it were being worn around the house as armour by children pretending to be Roman soliders (with a large bust). I couldn't face the prospect of being wrapped up in cling-film and parcel tape all over again, even though my husband offered to repeat the exercise that very evening. Instead, after inspecting it for spiders, I retrieved my old mannequin from the garage and set to work on her instead. This mannequin is a petite adjustoform, but she really is very, very petite and much slimmer than me, with an almost non-existent (but enviably high) chest and no sign of a bottom at all. No amount of being able to turn the dials to make her larger can replicate my figure, as she just becomes bigger, but without any increase in lumps and bumps. However, I've discovered that a mannequin that's smaller than you is a good thing as she's a blank canvas on which to impose your own figure. 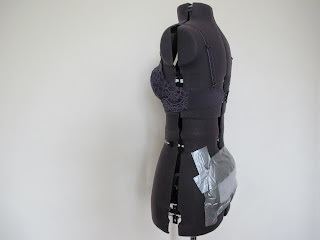 I was able to pad out a bra on her, before adding some wadding to her bottom too. I then stood back-to-back, side-to-side and front-to-front with the dress-form and my husband assessed whether we were identical from every angle. After much dial turning and re-padding he declared that she did indeed look just like me (although I rarely wear quilt batting taped to my bottom with Duck tape). I made another black Lycra cover to disguise my additions and provide something to pin to. Once I was sure that I was happy with everything, I set about adding some lines that would make drafting patterns directly from her more easy. Traditionally this is done with something called Bolduc tape, which I was unable to buy. In its place I bought some cord that's a little like very narrow, flat shoelaces. It took two evenings of hand-sewing to attach them all and get them placed just as they're meant to be. I've now spent a substantial amount of time working with her and feel really quite delighted - she's absolutely perfect and the guide lines now seem worth the investment of time to get right, as they're incredibly helpful for draping the fabric properly. It feels rather a traumatic path to get to this point, but I thought it was a tale worth sharing, so that if you're tempted to make your own body-double you may be able to learn from any or all of my many mistakes. This is the finished top that I showed mid-construction in my post about trimmings. 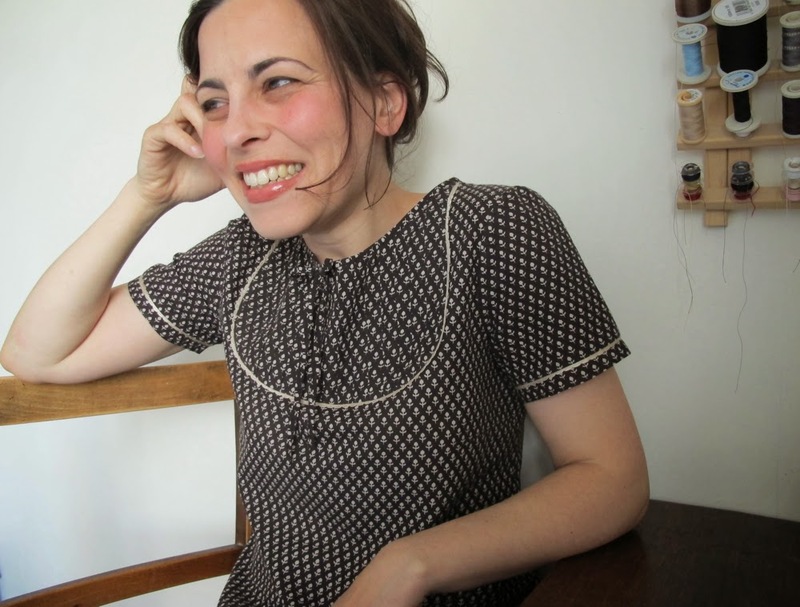 It's inspired by an Orla Kiely top that I spotted on her website, complete with amazing aeroplane print - I did contemplate feeding my children on stale bread for a month in order to buy it, but in the end a fear of rickets won out. I often find that although I feel I can have a good attempt at pulling off a wearable version of a coveted off-the-peg garment, finding the right fabric to do this is trickier. 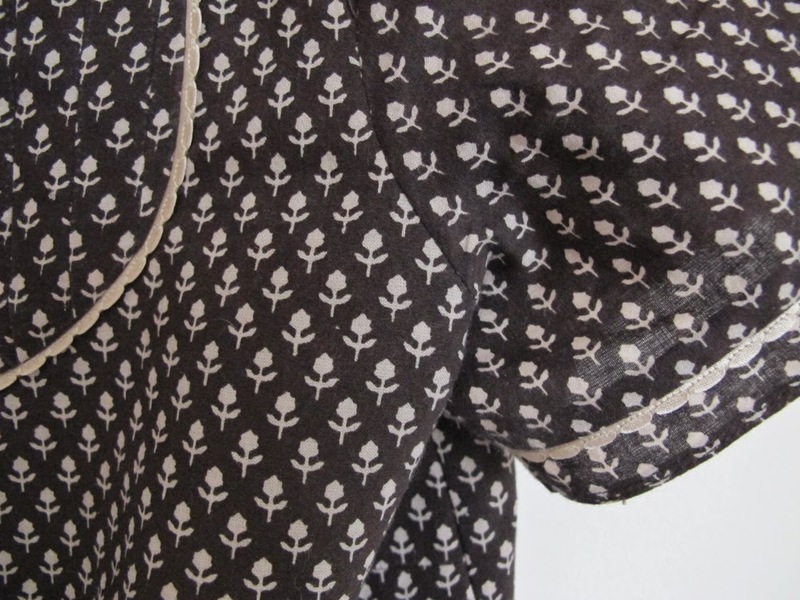 But I love this cotton, which I spotted in The Cloth House a while ago - the very stylised print reminds me of the type of design you might see on the clothes in the Orla shop. However, I'd still love to find a source of end-of-bolt Orla Kiely fabrics. 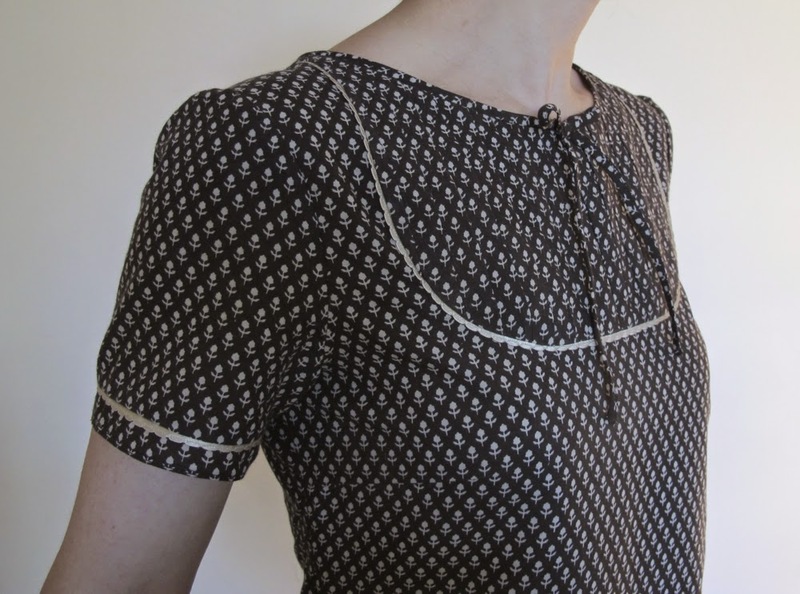 I kept true to the knife-pleated yoke on the original, but I actually wish that I'd followed the Orla Kiely design more slavishly now, as although the cream picot trim was fun to sew, it doesn't feel as beautifully minimal as Orla's perfect-in-every-way aeroplane top. Sometimes it's so difficult to balance out the fun of sewing with what I really want in my wardrobe...this time the fun won. I had huge (yes, really, huge!) 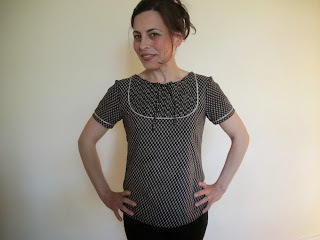 amounts of fun with the bias binding maker that I used to make the self-binding for this top. 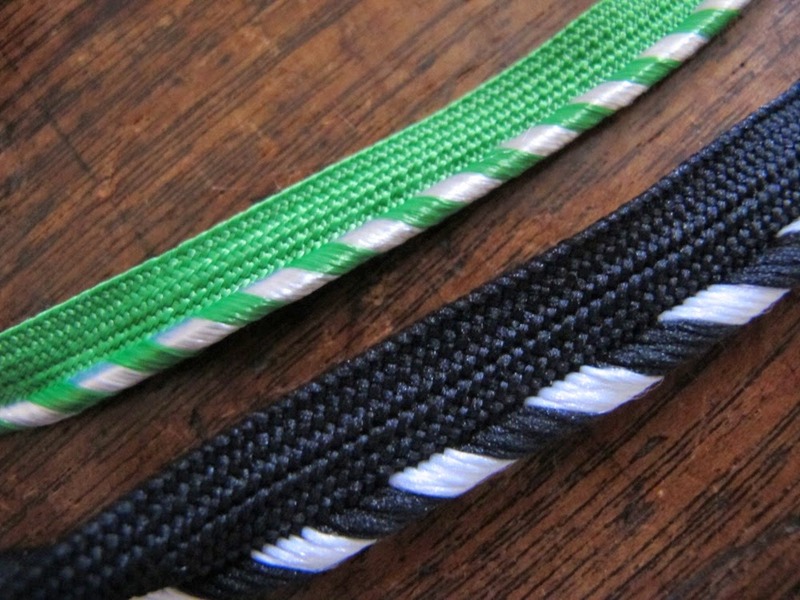 I always make my self-fabric bindings by cutting a bias strip and then folding and sewing it by eye. 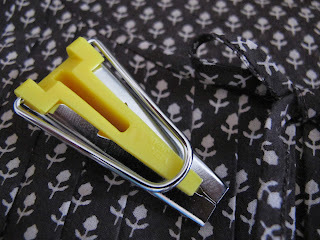 However, this bias maker means that you can make pre-folded bias tape pressed crisply with an iron, making it as easy to apply as shop bought binding. This post holds the curious thing of photos that are not simply Florence-standing-against-a-cream-wall, but Florence-sitting-against-a-cream-wall! I find it really hard to find places in my house where I can be photographed...anywhere other than a blank wall seems to have too much clutter as a backdrop. Taking photos for dressmaking posts is quite different from any other area of sewing. It requires you to a) put photos of yourself in the post, with or without your head depending on how weirded out by the whole Internet thing you're feeling on that particular day b) to discuss fitting issues and, if you want to be helpful to other seamstresses when sewing from a widely available pattern, the odd body quirks you have and how you negotiated sewing for them c) publicly face the fact that no matter how well you might have sewn the garment, it simply may not fit well (it may actually be a sartorial blancmange) - not something one has to cope with when making quilts! d) attempt to make those photos something that won't make you cringe if you happen across them by accident on Pinterest. How do you feel about the photos of yourself that you put on the Internet or do you avoid it completely? After six years of blogging I still don't feel blasé about putting photos of myself online - quite frankly it still feels downright freaky, but I find it difficult to tell if that's because I'm a super-reserved sort of person or if it's because this is an odd period in technological change where we're the first generation where it's become wide-spread to do so. I wonder about whether for my children's generation having some form of online presence will be as natural and unquestioned as having a postal address. I love collecting insert tapes and piping: finding the right one can instantly change the look of a piece of clothing or a bag. Most recently I've been hunting out ones that are cut on the bias or have a bit of stretch to them - this makes them perfect for inserting into a curved yoke on a top. Below are two different inserts. I got the first, in the upper photo, perfectly sewn in before deciding the colour was a little too bright compared to the duller cream of the flowers on the fabric - it was more obvious in reality than these photos show and unpicked it to replace it with the scallop-edged insert in the second photo. 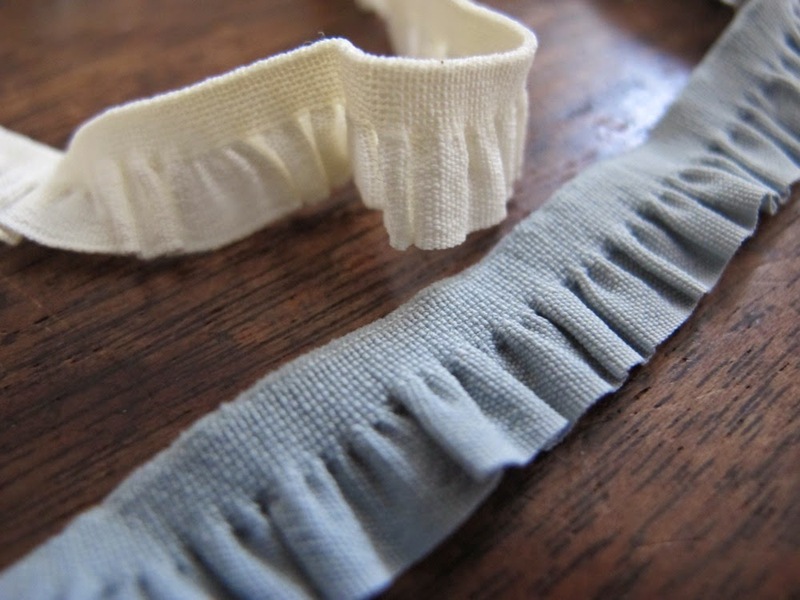 I think some of the elasticated edgings may be intended for lingerie, but I can't see any reason why I shouldn't use the straight band as an insert, so all that's left showing is the tiny picot edge. And I think this would be wonderful if it was hand-sewn to a finished top. My sister bought most of these for me when we stumbled across a ribbon and trimmings shop near her flat in London. 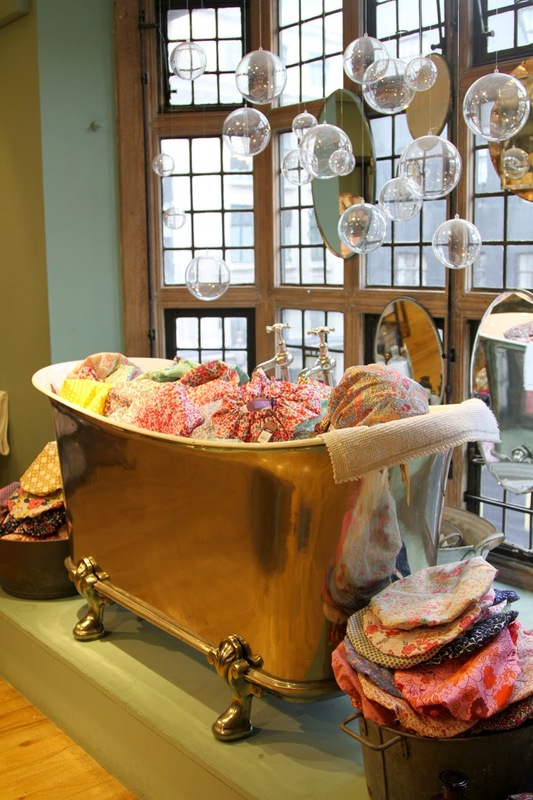 MacCulloch and Wallis also has an amazing selection and I'm lucky to have two shops with large haberdasheries close by. I think with trimmings it's worth buying something when you see it - it's difficult to source just the right thing when you're in the midst of a project and they're inexpensive, with many costing as little as 30p per metre. Do you have a fantastic source for things like this? In other news, on Thursday I met with the loveliness that is Christine Haynes. If you don't already know of her, then I can tell you that she is a multi-talented LA-based seamstress who has her own line of dress patterns; teaches Craftsy classes and writes for their blog; is the writer of two sewing books (the second is yet to be published) as well as her own blog; teaches sewing at the fabric shop where she works and makes almost her entire wardrobe from scratch, watched by two cats. 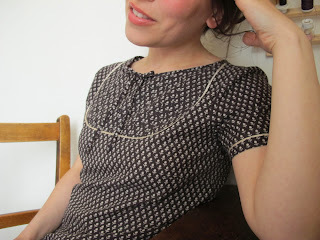 She is also an all-round nice-girl, cutie and fellow addictee to the Laurel pattern. I'm unsure how she fits in basic things like breathing, but she appears to be alive and quite sane on her extreme diet of fast-paced sewing-related activities (I am like a tortoise by comparison and Christine did - kindly - tease me over my tendency to spend four weeks painstakingly sewing something two inches big that may or may not be intended for a grasshopper that I saw at the bottom of the garden several weeks ago. It's true. My sewing is often total non-sensical self-indulgence). Anyway, she and her man took a few days out from their annual stay in Paris to come over to England and it was lovely to be able to meet up with them for lunch. It's always an odd thing to be finally meeting with someone who you feel you know through their photos and blog posts, but have never actually met, but Christine was just as lovely and warm as I'd imagined her to be with the added surprise of being incredibly funny and leaving my face aching with smiling. Ever since I'd known she was coming to England it had been rolling happily around in my mind that, if in reality she seemed to be the kind of girl who wouldn't shoot me down for asking such a ridiculous question, then I could put my ever-burning question to her: do all Americans whiten their teeth? Is the application of bleach advised upon in the same nonchalant way as braces? Is this a procedure that's seen as no more serious than having one's hair cut or one's leg-hair removed? I was delighted to find that both she and her partner arrived armed with three of their own, far more bizarre, questions about Englishness. She did give me an answer to my question but, selfishly, I'm not sharing it here, because I've gained new confidence to pose superficial questions and would like your independent opinion if you happen to have personal knowledge about American dental habits (but don't limit yourself to the USA - I'm happy to hear about any nationality if you have inside knowledge). We went to the newish Covent Garden branch of Lewes' infamous Bill's restaurant. We ordered lots of delicious food, but ate little of it because we were too busy talking. 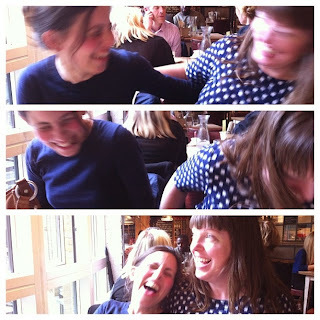 Just before I left, Christine's man took a few photos for us - there were not very many sensible ones, as you can see from the trio of outtakes which Christine put together. Isn't Christine's dress gorgeous - it's a Laurel made from blue ikat. 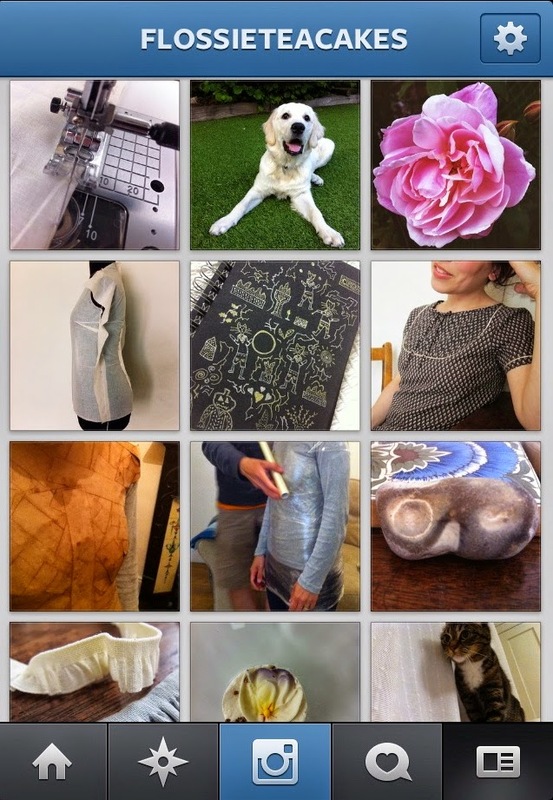 Did you follow anyone's Me Made May photos (where the challenge is to wear handmade for every day in May and take selfies to show off each day's outfit)? 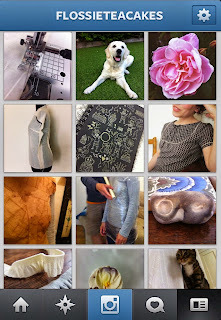 There seemed to be so many lovelies taking part this year (and indeed there are over 5,000 photos in the Flickr pool!) 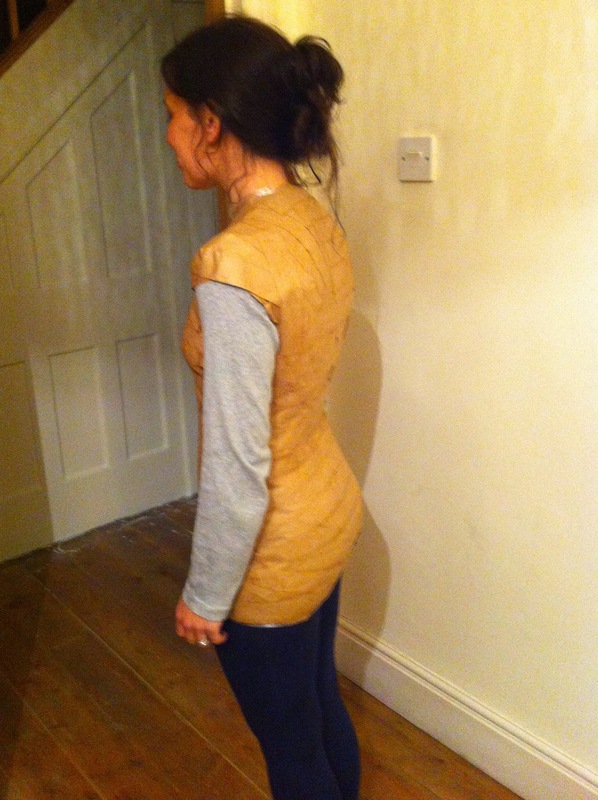 and it inspired me to make more things that are 'everyday wearable'. Because of my obsession with fabrics that have a good drape, I'm often drawn to crepe de chine or other silks (they are just so lovely to sew with), but I do find that although I've made a great many garments, often they wouldn't actually be practical or appropriate for an ordinary day without having to wave my hands at small children, dogs and fresh-from-the-garden husbands in a 'this is my dance space, this is your dance space. I don't go into yours, you don't go into mine' motion (affectionados of the film, Dirty Dancing, will know exactly what I mean by that. I'm Patrick Swayze - silk, rather than muscle, clad - and the rest of the world is Jennifer Grey with spaghetti arms that threaten to leave greasy paw marks on my clothing). With this in mind, my self-made clothing aspirations are to make more items that could be worn without having to guard against close-proximity interactions. That doesn't seem too lofty an ambition. 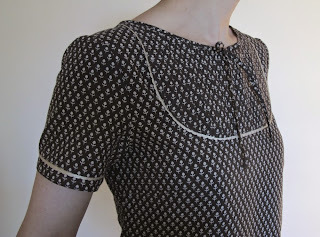 I've worn this top (which I'd said was my least favourite Laurel, but is actually now my favourite) a lot and last week I whipped up another cotton top which I'll share with you in my next post. 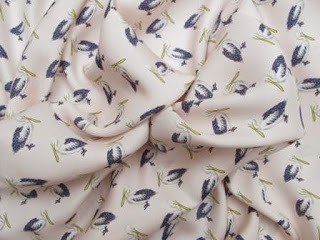 When I met with Christine, I also fitted in a quick trip to Liberty, where I was able to stroke Amy Butler's rayon challis fabric in person: this is the thing of dressmaking fabric dreams. It's practical and looks easy to sew with, but has the most amazing drape and feel. It's soft and swishy, but not sheer and insubstantial. It took all my willpower not to buy it, as the colour and pattern were all wrong for me, but I wanted it so, so badly. Over the last week or so I've been trying to choose some fabric for a summer dress. 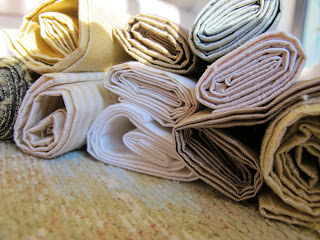 I wanted a fabric with an amazing drape that doesn't need lining. I don't mind if it's jersey, but it doesn't need to be - it just needs to have a fluidity to it in the same way that jersey does. Anyway, I've now searched in so many places and come up with a shortlist of things that feel like they could work, but it's taken me so long to gather up these fabrics that I thought you might like it if I shared them with you, just in case you're in need of your own drapy fabric for a summer dress (I'm thinking maybe a Miz Mozelle style dress of the variety I've made before - pictured at the top of this post), but feel exhausted by the prospect of researching fabrics. I love the fabrics I'm sharing with you here but I've had to hunt quite hard to find them, so I really long for more designers to start bringing out simpler prints when it comes to dress weight fabrics. 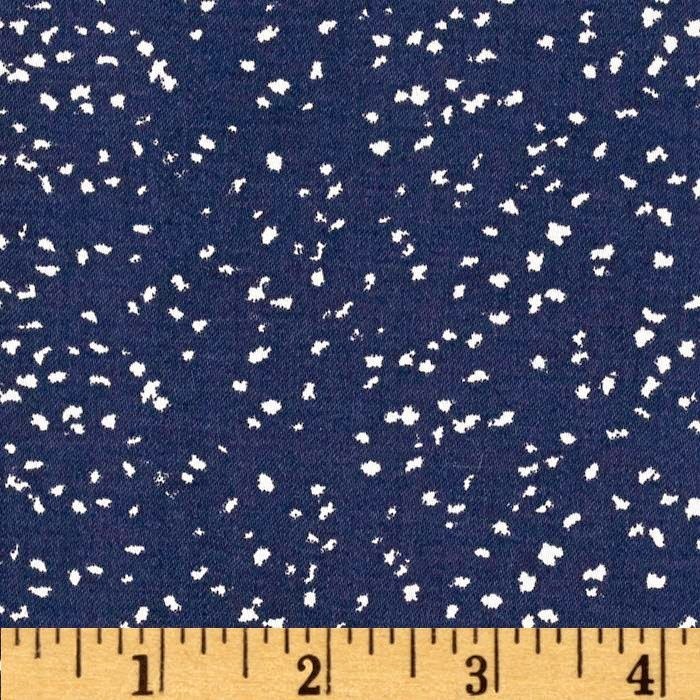 Buying dressmaking fabric over the internet can be a risk. While I'll happily buy from an anonymous bolt of fabric when I'm in a shop where I can feel the quality and drape for myself, if I'm buying online I quite like the reassurance of being familiar with a certain fabric houses' substrates. 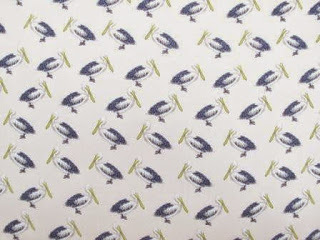 For example, voiles by Free Spirit, Rowan and Art Gallery Fabrics are all of identical quality and drape, so I only need focus on which prints I like. This is why, despite unbranded dressmaking fabric being widely available on the internet, it's simpler prints from trusted fabric manufacturers that I'm coveting. 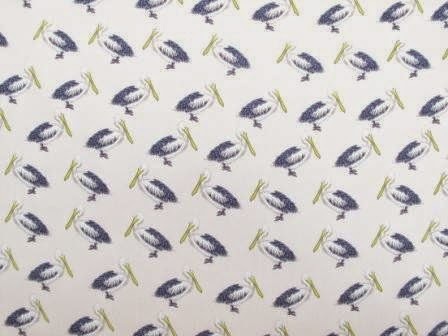 I think this Waterfront Park print, above, by Violet Craft would be amazingly wearable in a jersey or rayon challis (it's pictured here in quilting cotton). Anyway, onwards with my finds. 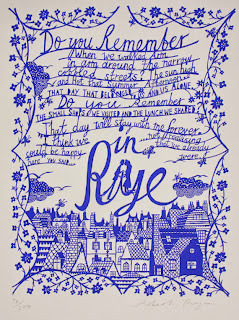 First, this gorgeous Amy Butler print. 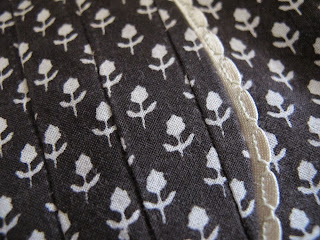 It's part of her new range of Alchemy Studio dressmaking fabrics. 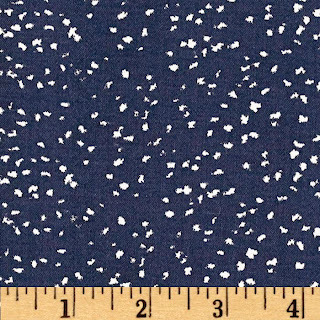 Most of the fabrics in the range are voile, which are too sheer for an unlined dress, but this is cotton sateen, which I think one could get away without lining. 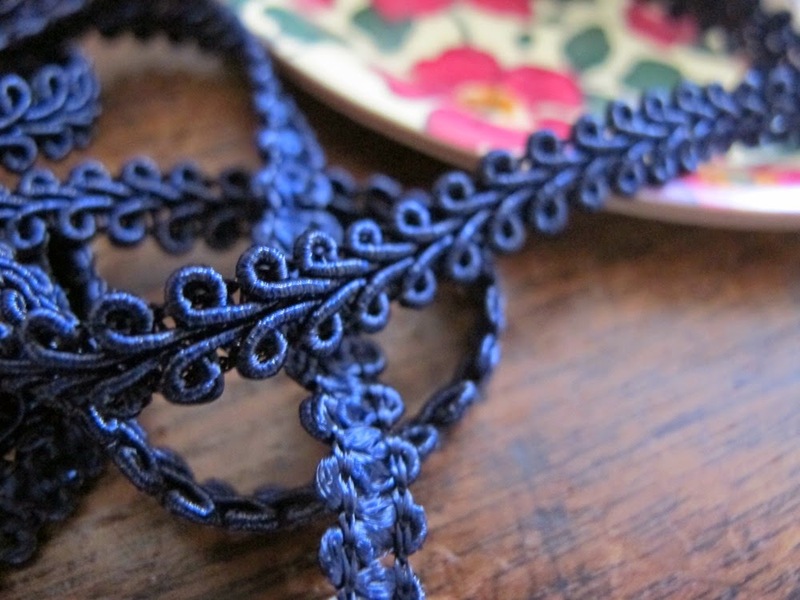 My experience of cotton sateen is that it has a fairly matt lustre and that its drape is wonderful. Annie has it in stock here. 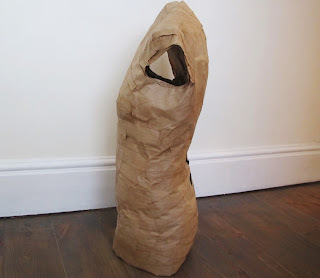 The photo below shows a dress made from it on Amy's Butlers own site. 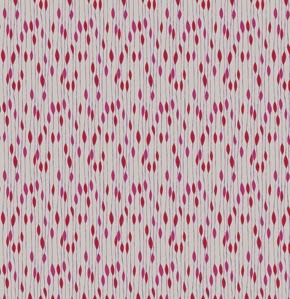 My next possibility is Anna Maria Horner's rayon challis, which has an amazing drape and a more matt finish than regular rayon (I know, because Kate sent me some gorgeous samples, but I was too slow off the mark to ask for the print I really wanted before she sold out, but she has the rest in stock here). 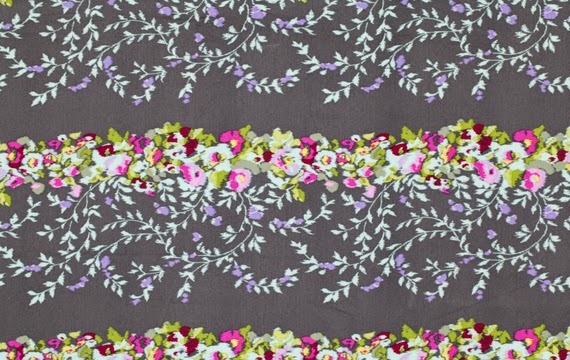 However, Dragonfly Fabrics still have my favourite print here. 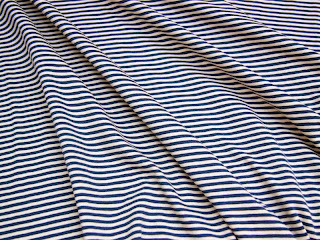 And you can see a photo of a finished dress made using this print here - the dress is lined, but I'm hoping that's just because it's a very straight cut and not because a fuller dress would need it. 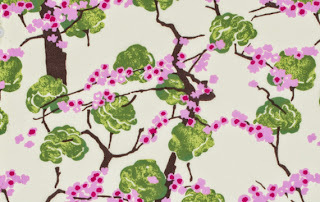 I love this print and, for a small person, I think it's the most wearable out of the rayon challis prints from Anna Maria Horner. 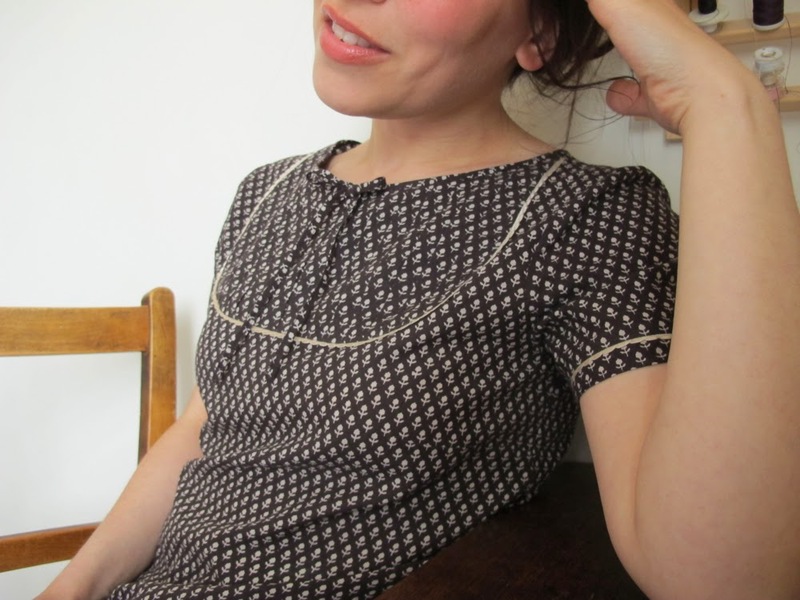 Amy Butler has a few rayon challis prints available also, but again, the prints feel too intense to wear easily. 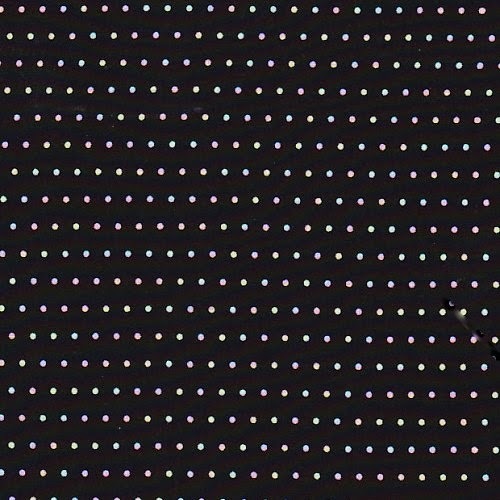 Fabric.com in America has quite a few good options. 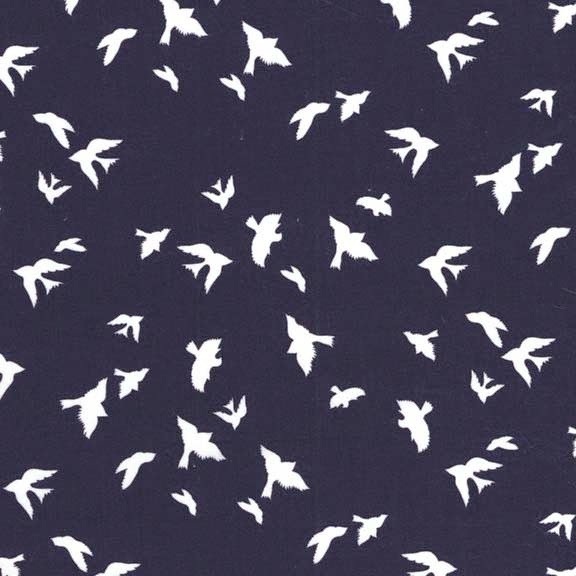 I am totally in love with this print pictured below. It's cotton sateen with a bit of stretch added - it says it's 'full-bodied' though, which is making me wonde if it's the more substantial variety of cotton sateen that you'd buy for trousers. I haven't shopped there before, so I'm unsure as to what the quality of the fabrics will be like when they're not from a fabric designer that I'm familiar with - have you shopped at Fabric.com? 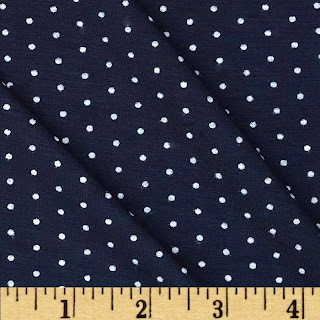 Assuming it may be the wrong weight, then they have this navy polka dot bamboo jersey (all the bamboo jersey I've come across has an amazing soft drape, so I'd hope this would be the same). 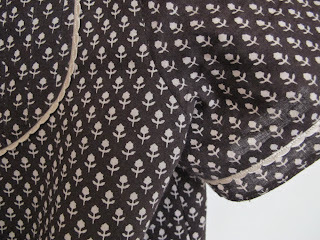 I also love this rayon challis, below, with its tiny, wearable print from Valori Wells. 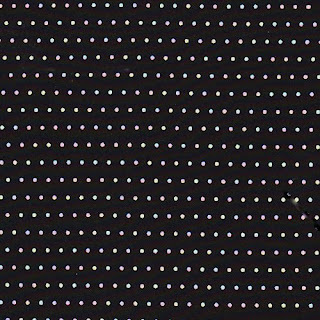 You can see the other designs she's released in this substrate here. 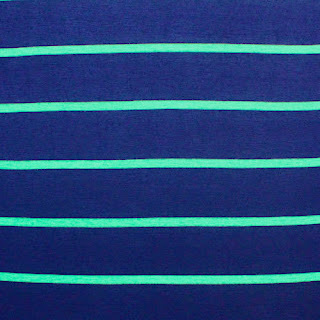 Going off the summer dress theme for a moment, I also adore this voile from Amy Butler. 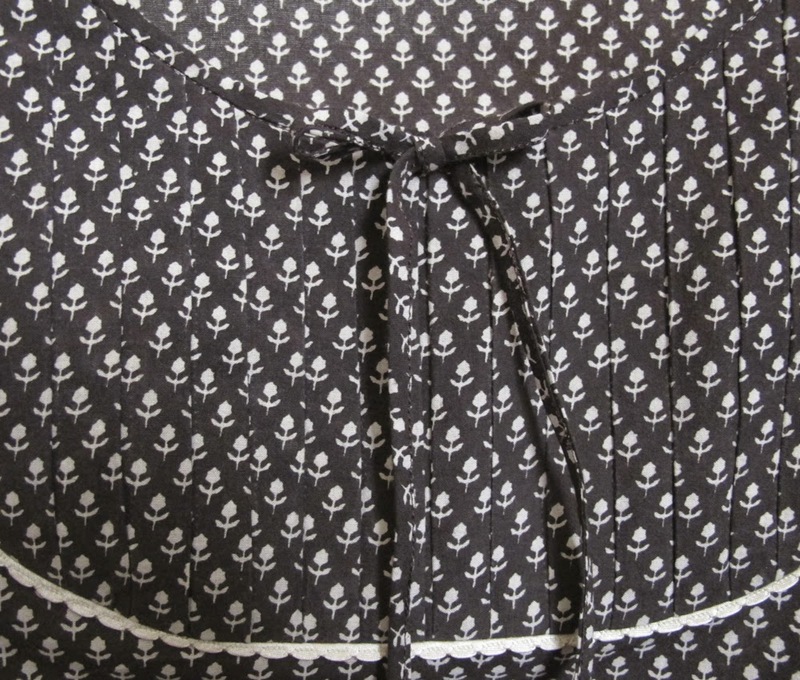 Too thin for unlined dresses, but perfect for a pair of pyjama bottoms or a blouse. 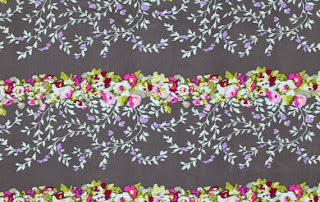 I've been coveting it ever since I saw it in Liberty (unfortunately priced well beyond what you'd expect to pay for an Amy Butler voile, so I left it and thought about it all the way home). Back to dresses again, I like this stripy jersey below. 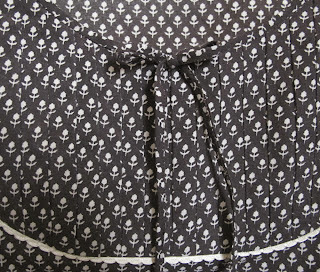 Boden's Newquay dress (pictured second below) seems like good inspiration for how this could be used. Raystitch now also have the bamboo stretch knit that I used for the dress pictured below (original post, here) in navy - hurrah! I love navy for clothing. 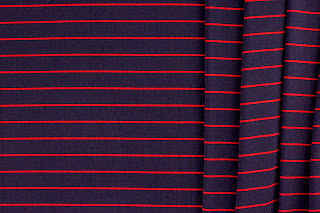 I think this would make a fantastic Miz Mozelle and it could always be livened up by using a contrast binding on the sleeves and keyhole (although I prefer my navy unadulterated, so I'm pondering making a plain one). 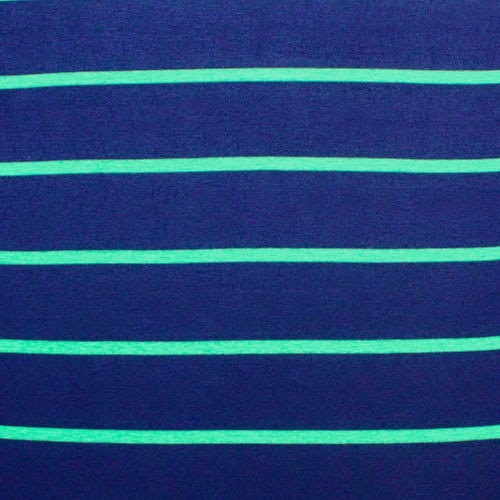 Americans can find a similar plain navy bamboo jersey here. Have you heard of a fabric called Ponte Roma? My off-the-peg experience of it is that it's a very thick jersey with a visible horizontal weave. It holds it shape well and doesn't crease. It's sturdier than regular jersey...the type you couldn't get a VPL through. I'm not sure it's suitable for the flowing dress that I'm currently envisaging, but as I came across it several times on my fabric searches I thought it may be worth mentioning in anticipation of autumn sewing. 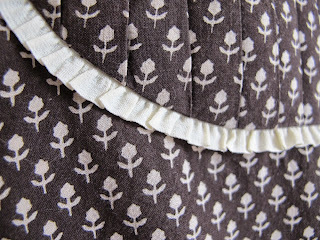 I think it would be fantastic for a more full-bloom tulip skirt than the one below (which I mocked up from two fat quarters on my mannequin several months ago). 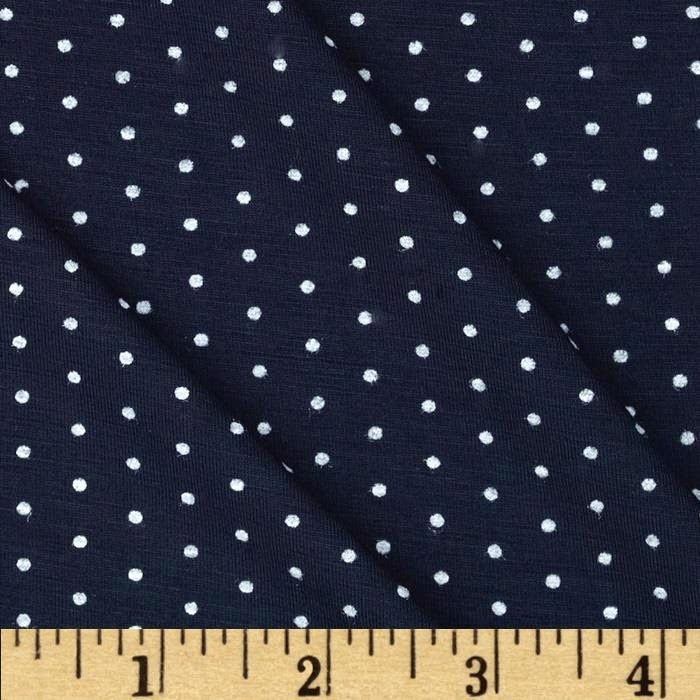 I've found some ponte roma at Stone Fabrics (again, new to me) in...navy. 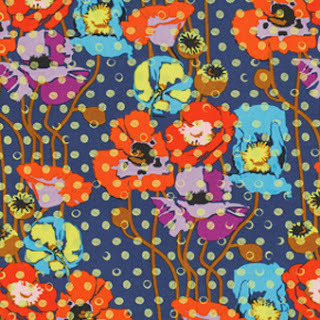 For my next fabric, I actually have no idea if it would be suitable for a dress, but certainly a blouse. It's being mentioned purely because it makes me feel quite loopy with joy just thinking about it (my search was full of distractions). Pelicans. But not overtly I'M WEARING CREATURES ON MY CLOTHING pelicans. But subtle, lovely pelicans that almost morph into a geometric pattern when viewed from further away. It's blush coloured silk. That's the kind of fabric you'd expect a shop called Fabric Godmother to be able to source. Back to more practical options. I like the simplicity of this polka dotted black jersey a lot. You can find it here. 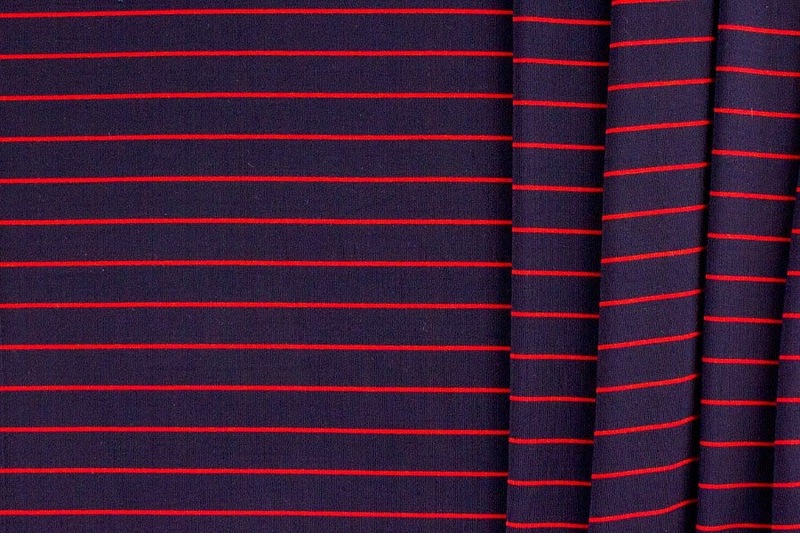 I also love this drapey red and navy jersey knit. I think that probably ties things up. 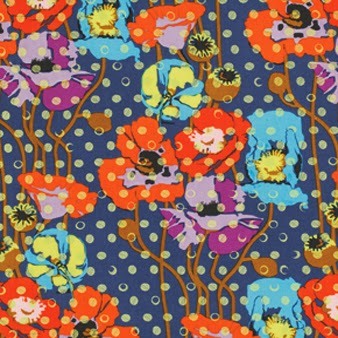 Do you have an online source for amazing dressmaking fabric? If you do I'd love to hear it. Somehow it's over two weeks since I've written anything here and I'm now receiving complaints from my sister about a lack of posts (and an email of concern from Mary - thank you, Mary!). 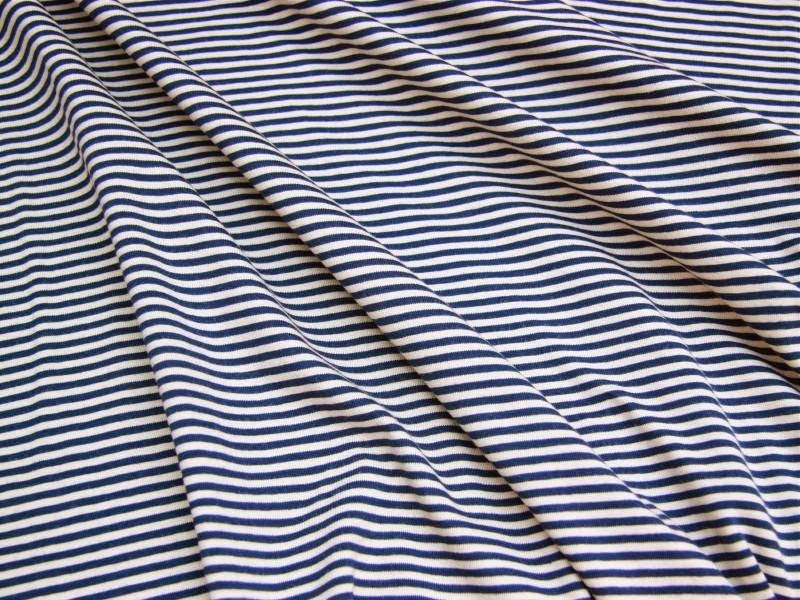 I don't have any finished sewing to share with you, but my sister said 'and don't write about sewing' when putting in her request for a blog post, so I'll share what the fabrics at the top of this post are intended for another time. 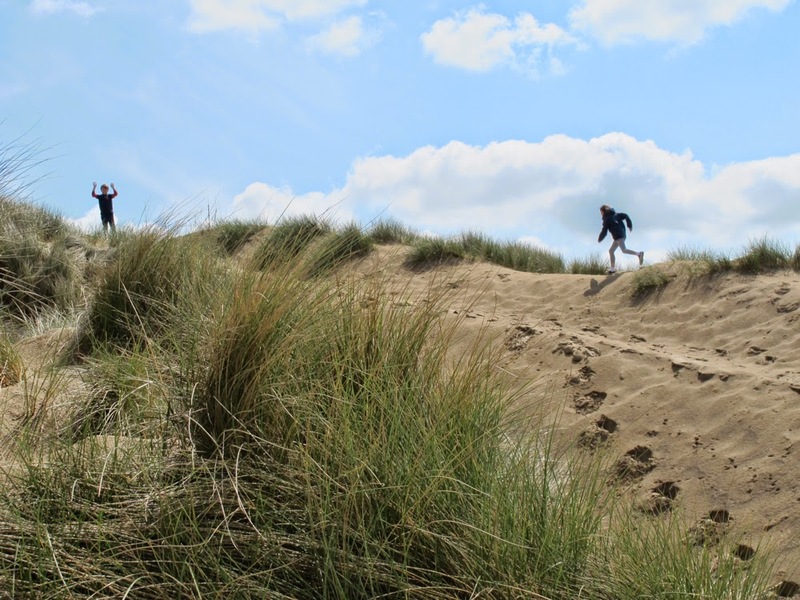 Instead I thought I'd tell you about the things that I was mulling over during the busy (but lovely) half-term week we've just had. A friend, Katy, had asked if she could make a recorded interview about places that are special to me for a paper she is writing as a part of her psychology degree. I wasn't sure what Katy's hypothesis might be, so it was fairly open-ended as to what kind of special places I should talk about - I was unsure if it should be that the place itself was special or whether it should be the memory of a time there, but once I started thinking about it I wondered if the two are inextricably linked for me. The only stipulation was that it shouldn't be somewhere in my own house (which meant that my sewing desk was unfortunately eliminated). After pondering over it in the days before we met, I eventually narrowed it down to three places. The first was my grandmother's old house: a tiny and very tidy terraced house in a run-down part of Macclesfield that felt entirely magical because of the person that she was to me and my sister during our early childhoods. I told Katy about the enormous, soft powder puffs that my grandmother kept in her bathroom that my sister and I would use to create huge talcum powder clouds with; the Chesterfield sofa, which for years was a horse in our games (in the photo above I'm sitting on top of the Chesterfield above my grandmother and sister, who alarmingly looks slightly stuffed, she never actually looked like this*); the maracas and castanets that she kept by her huge bed which we would use for raucous renditions of Doris Day songs or rowdy hymns, inspired by accompanying our grandmother to her pentecostal church where people would suddenly shout 'hallelujah' from the pews, seemingly apropos of nothing other than a need to openly rejoice. Sometimes our grandmother would shock us by doing this too. It wasn't the kind of reserved worship that my sister and I saw in our school's church, so it felt particularly delightful in its eccentricity, despite it failing to sway either of us into believing anything we heard there. My grandmother's house was not a shrine to good taste and I think that was why we loved it so much there - it was decorated with all the things a child would probably covet (but be refused) if they knew they existed: garden gnomes outside, pink bulbs in the wall lights, a trolley to take the plates through to the dining room (which we tended to 'drive' rather than push. I served dinner onto the carpet on more than one occasion), Toby jugs lined up on shelves and a carpet so thick that the vacuum cleaner left track marks in it. 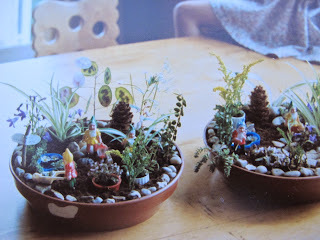 We made the beautiful gnome gardens in the photo above with her. I've wanted to do this with my own children but have never found such tiny gnomes. 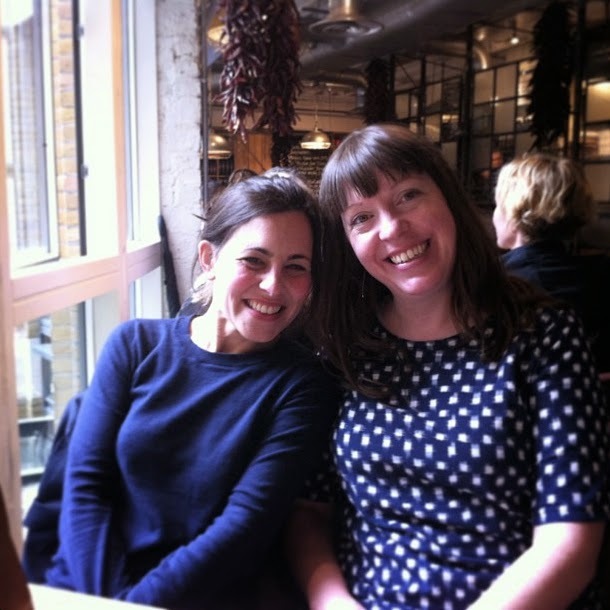 Katy wanted to know whether any of the places I talked about had changed me as a person. The others, not really, but I really think this one did. Not least because it was in that house that I was presented with my very first sewing basket. 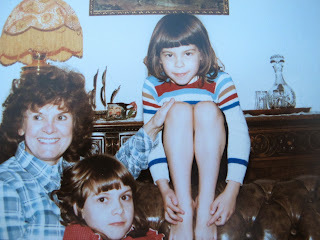 It was wicker with red satin lining and my grandmother filled it with beautiful threads and shiny-headed pins for me. She taught me how to embroider things that Christmas...I've never been terribly good at embroidery, but it's nice to remember being taught some needlework. We actually called our grandmother, Nannie, as that was what she preferred, but 'grandmother' seems a less personal word when talking about her to other people. When I was talking to a taxi driver I once referred to as Nannie accidentally, to which he replied: Jesus Christ, you sound more like someone off Downton Abbey every minute. I think he'd misunderstood and thought I was referring to a live-in nanny, but as we were near my home I enjoyed replying 'you may set me down here then, driver'. To which he burst out laughing, so I think he must have realised that I was joking. I am cringing slightly to say that my second place is Liberty. But it's not just because it's home to lovely fabrics or because the wood panelling and quiet halls create a feeling of serenity and calm (although if sewing is at the heart of my life in many ways then is it so very odd to choose somewhere fabric related?). It's also where I chose my engagement and wedding ring with my husband when I was 23; it has rooms that, for me, echo with the laughter of happy visits made there with Jo, Helen & Lisa; its chocolate room is the first place my husband visits when we go into London; and after visiting with my daughter for the first time this Spring, I also have happy memories of seeing her delight and love for it - so in many ways it feels very much a family and friends shop for me. 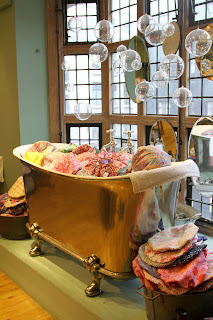 I've borrowed a photo from Pat Bravo above, as my only photo of this amazing bathtub has my daughter in. Do go and have a look at Pat's photos from her visit to Liberty - they are stunning, particularly the sewing related ones which start half-way down her post. Finally Rye. It's our short break or day trip destination that never fails to offer a feeling of having been completely revived. We seem to set off with the intention to have fun there and always do. We wander around the cobbled streets, eat ice-creams, sit on benches and chat and time seems to slow down. We then potter off to the beach at Camber or go for cakes at the tea shop in Winchelsea village and if we're staying overnight we enjoy going back to our room at The George. 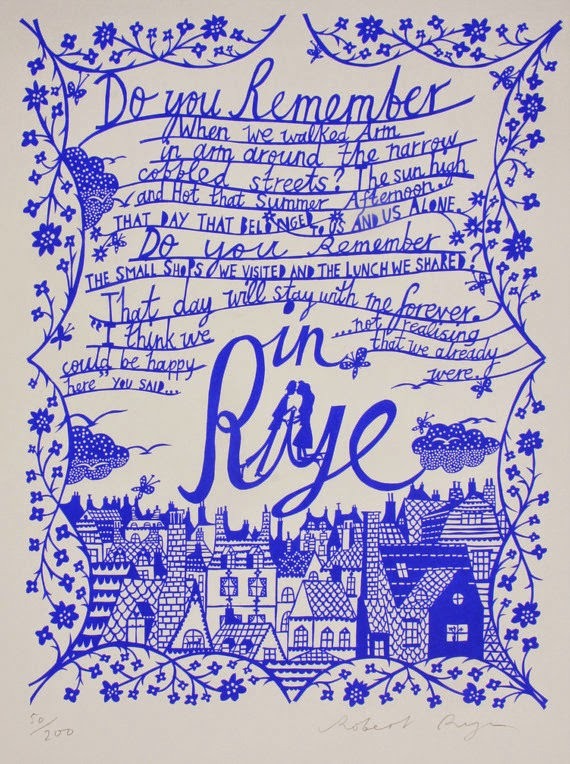 I thought we may be alone in our love of Rye and how perfect things feel while we're there, but I spotted a Rob Ryan tea towel in one of the shops and when I read the words he'd cut, I realised that Rye seems to inspire a universal feeling of contentment in everyone who visits. My husband would love to live there, but I don't want to break the spell of its loveliness by having it as part of our everyday lives. 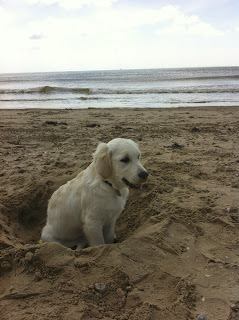 Last week we went again, but this time with Nell. I was worried that it would feel different with her there and that her presence would alter the dynamic of the four of us being there together (because it feels like she's altered it in so many other unexpected areas, not all bad, but with that same repositioning that takes place when you add a new baby to the house. I hadn't expected a dog to be capable of creating that feeling of all the pieces having been thrown up in the air and having to wait patiently for them to land in harmonious new positions). 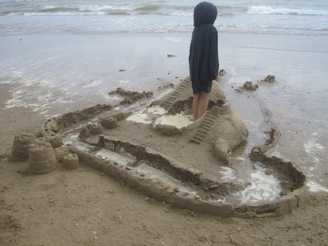 But actually, she added to, rather than detracted from our time at the beach. 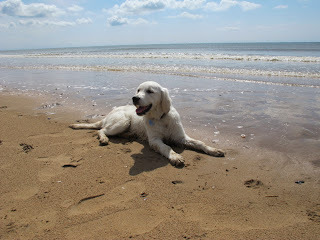 She ran with such joyful enthusiasm (ears flapping wildly, tongue hanging out) in the sea with the children. It was her first time off the lead and to our surprise she didn't seem to want to run away, but ran excitedly between each of us until she'd got used to the sensation of being completely free, at which point she dug a very large hole, which she then sat in to watch the kites and other dogs. Nell is generally a complete delight, but I'm struggling with how 'different' she feels from us in some ways - she has none of the sweet reserve that my children have always had that's made me feel I can take them anywhere. Her doggish spirit which makes her so warm, friendly and fun to be around, is also what makes her excited by everything and so difficult to control. Her size belies how young she still is, so I often feel mortified by her behaviour and find myself having to hold her lead just a few inches from her collar to stop her from jumping up at people. I worry over becoming an awful dog owner who lets her dog run riot while looking on with a beatific 'what more can I do?' smile on her face. Never having had a dog before it's difficult to tell whether we're expecting too much of her and this is fairly normal for a five month old puppy or if we we're missing something fundamental in our training of her. Answers, reassurance, suggestions? I would love them. As I write this she's off at a training class with my husband that takes place in a lovely orchard - when they return I always ask hopefully: is she good now? But really, training seems to be a minute-by-minute thing that can't be undertaken in an hour a week. Every time I unload the dishwasher or sort the washing it's an exercise in getting her to 'sit' and 'stay', leaving the dishes and socks undisturbed. Often she does this perfectly, wagging her tail in anticipation of the treat she'll get in reward. Other times she'll lurch forward without warning and her wet nose will suddenly push in insistently and she will make off with stolen socks hanging from her mouth (she does actually look adorable when she does this, but when I'm in a hurry to try and get something done then it becomes frustrating). 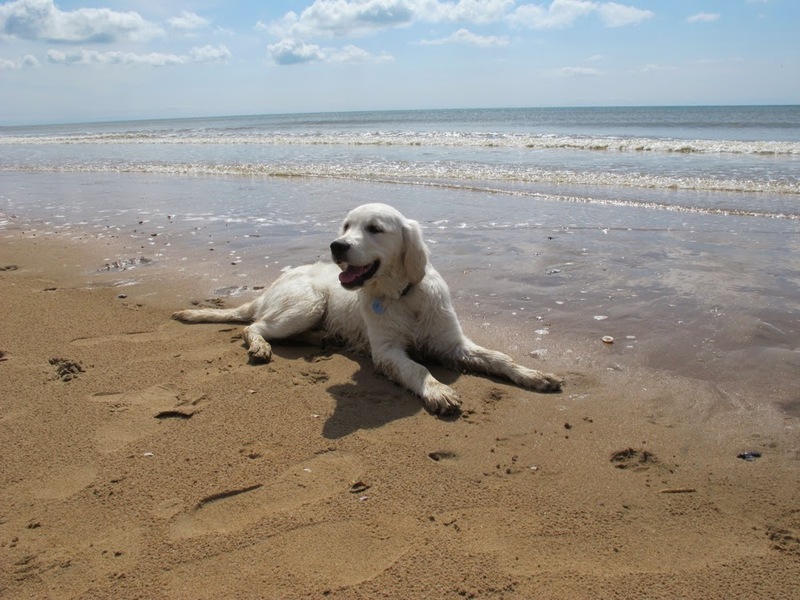 Part of the problem is that she has a huge amount of energy to burn off but, because golden retrievers are a breed prone to hip problems, she is limited in the amount of time we can walk her for in the first year while her bones are still developing. Several places were on my list but didn't quite make it: one of which is our greenhouse, which emerges as a new room to our house each year and where in the chill of spring we sit and chat on the sleeper-edged beds, before being ousted by plant growth as summer arrives. The fact that it is a room that only exists for us for a few months makes it even more special. Sometimes all four of us gather in there, other times my husband and I arrange to meet there if we want to discuss possible plans for the day without the children overhearing...or if everyone is in a bickery mood and we need to escape for a few minutes. But there is something lovely about being discovered there too: hearing the sound of feet trotting down the garden path and the door being flung open and the humid air being mixed with the freshness of outdoors again. 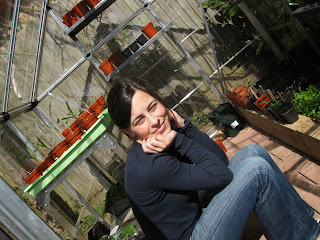 The children seem to love being in the greenhouse too. It's a place that forces me to stop and notice new growth where it may pass me by elsewhere. I was appalled to find myself fleetingly considering Waitrose, a shop where my sister and I agree such a sense of calm prevails as you push your trolley around its aisles that it's capable of also inspiring the sense that, for the time you are surrounded by this order, space and abundance of wholesome food, nothing bad can ever happen there. In my defence, I realised that when I go to Waitrose it tends to be that I go there with other people when we're feeling the need to have nicer-than-usual-food and will enjoy choosing things from the shelves together, as opposed to Sainsburys where I'd do our regular weekly shop alone (if I was organised enough to do a regular weekly shop) with none of the same feeling of frivolity. So perhaps I could consider it so well liked because of the people and mood that I go there with. 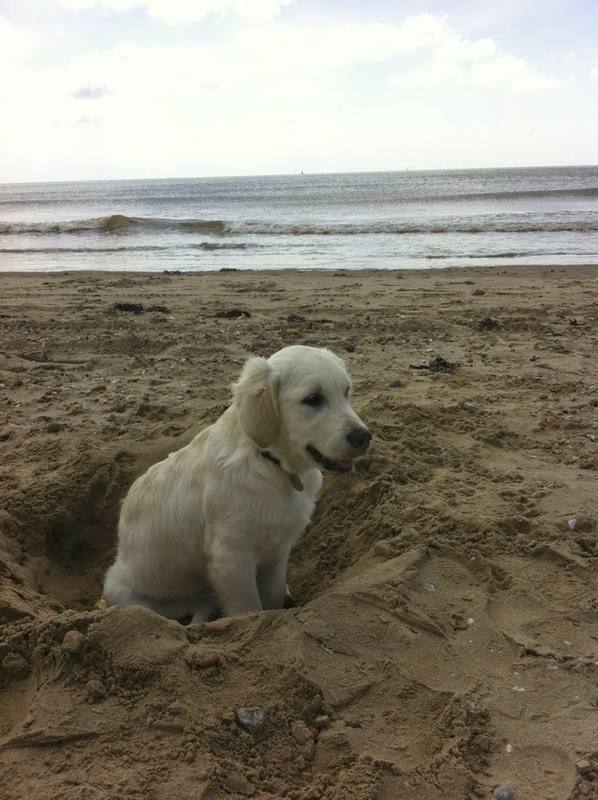 So that's a rather long and rambling post around my discussion with Katy, with some dog worries in between. Which places are special to you? Do you think a place is special because of what it is, or because of the people you're there with. Or would one of your favourite places be somewhere where you tend to be entirely alone? While we're off topic (sewing being on-topic), I thought I might tell you about a book that I'm currently reading. My sister lent it to me when I went to stay with her a few weekends ago. 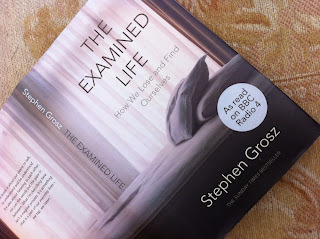 The Examined Life: How We Lose and Find Ourselves was originally read on Radio 4, but I missed that, so I'm now reading a little each morning as I dry my hair. It's divided into bite-sized case studies of Stephen Grosz' own patients, often featuring the moment where after years of psychoanalysis they grasp what's been underpinning their troubles and finally make sense of some of the patterns to their behaviour. It's fascinating and insightful and I'm now not wanting it to end because Stephen Grosz seems so lovely and as though his understanding of people comes with a complete kindness that makes the book relaxing to read, no matter how challenging the subject matter. It's not a self-help book, more a book about understanding the human psyche. I remember reading a book by Oliver Sacks at university, The Man Who Mistook His Wife for a Hat , that had a similar impact on me - I think it's a real skill to be able to write about the human mind in a way that makes it fascinating and accessible to laypeople and this is what both these writers manage to do so well. Anyway, I'd love to hear about your own special places, your what-you-can-realistically-expect-from-a-five-month-old-puppy thoughts or any good books you might be reading. * That my be the last time she'll ask for a non-sewing related post.